Booking resources - it's your services or properties (like houses, cars, tables, etc...), that can be booked by visitors of your website. 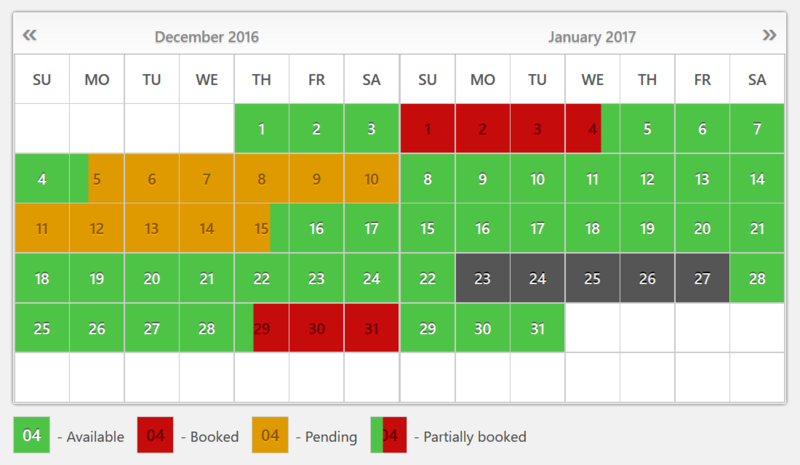 Each booking resource have own unique calendar, which will prevent of double bookings for the same date(s). It's means that you can receive bookings and show unavailable, booked dates in different calendars for different booking resources (services or properties). You can add/delete/modify your booking resources at the Booking > Resource page. at the popup configuration dialog, during inserting booking shortcode into post or page. You can activate and configure email templates for the different booking actions with shortcodes for any exist form fields and some other system shortcodes (like inserting address of the page (or IP), where user made this action). Manual export / adding of booking (by clicking on link) to Google Calendar. Import of events /bookings via .ics feeds from Google Calendar or Airbnb, Booking.com, HomeAway, TripAdvisor, VRBO, FlipKey and any other calendar that uses .ics format, like iCal application. Please check more here. Export bookings to .ics feeds (files), which possible to import in Google Calendar or Airbnb, Booking.com, HomeAway, TripAdvisor, VRBO, FlipKey and any other calendar that uses .ics format, like iCal application. Please check more here. Check many other nice features in Booking Calendar Personal version at features list and test live demo. Ability to make bookings for specific times (in addition to timeslots bookings, the bookings for specific start time and time duration or start time and end time, as well). Start time and end time entering in "time text fields"
Please note, if you will make the booking for specific times, this timeslot become unavailable for the other visitors for this selected date. You can even activate booking of same timeslot in the several selected dates during the same booking session. You can activate and configure these gateways at Booking > Settings > Payment page. You can even send payment request by email for specific booking. You can use the same date as "check in/out" for different bookings. These half booked days will mark by vertical line (as in this live demo). It's means that your visitors can start new booking on the same date, where some old bookings was ending. 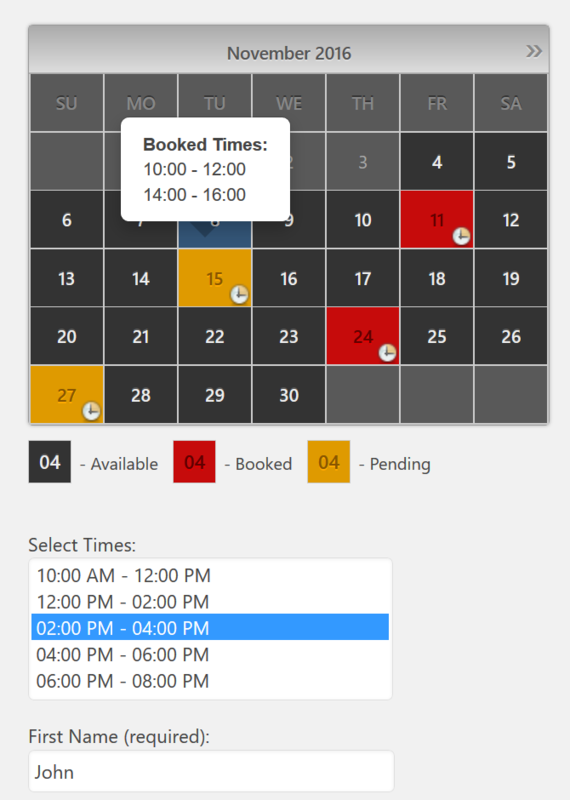 To activate this feature you need select range days selection or multiple days selections mode on the General Booking Settings page in calendar section.After this you can activate the "Use check in/out time" option and configure the check in/out times. For example, check in time as 14:00 and check out time as 12:00. Tip. You can also activate to show change-over days as triangles (diagonal lines), instead of showing them via vertical lines. Activate several days selection with 1 or 2 mouse clicks (by selecting check in and check out dates, all middle days will be selected automatically). Configure specific number of days selections for range days selection with one mouse click. 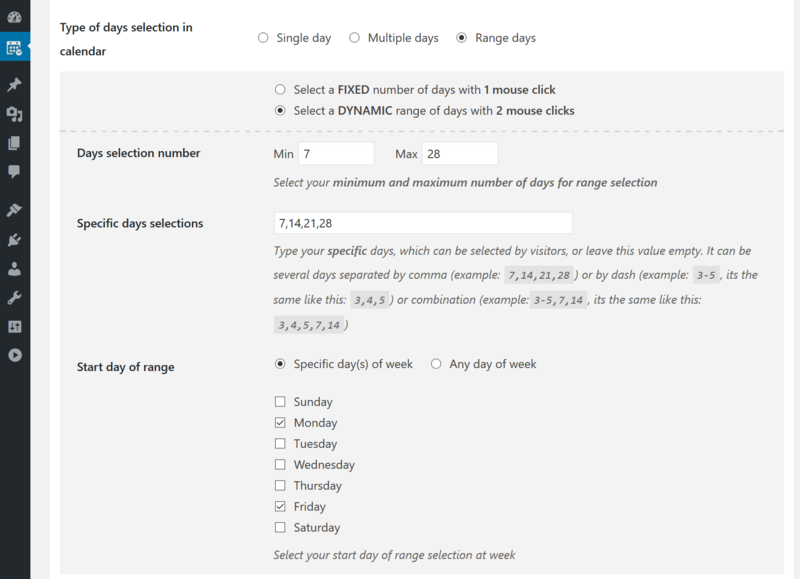 Or set minimum and maximum number of days selections (or even several specific number of days) for range days selection with two mouse clicks. In addition you can set start day(s) selections for only specific week days. You can activate auto cancellation of all pending booking(s), which have no successfully paid status, after specific amount of time, when booking(s) was making. 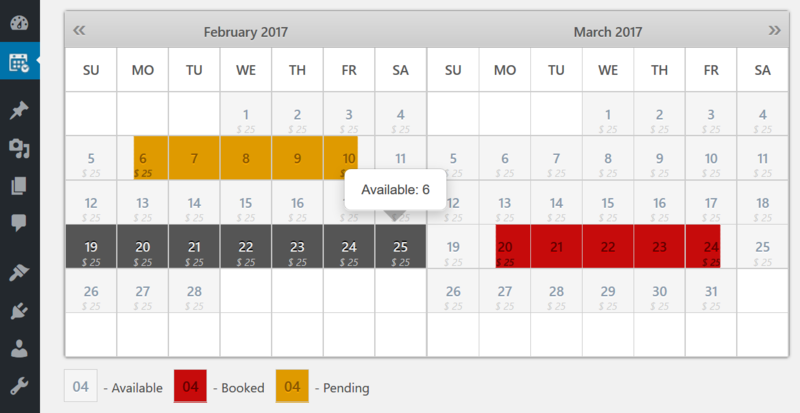 This feature will set dates again available for new booking(s) to other visitors. You can even activate sending of emails to the visitors, during such cancelation. Or you can activate auto approval of all incoming bookings. Check many other nice features in Booking Calendar Business Small version at features list and test live demo. 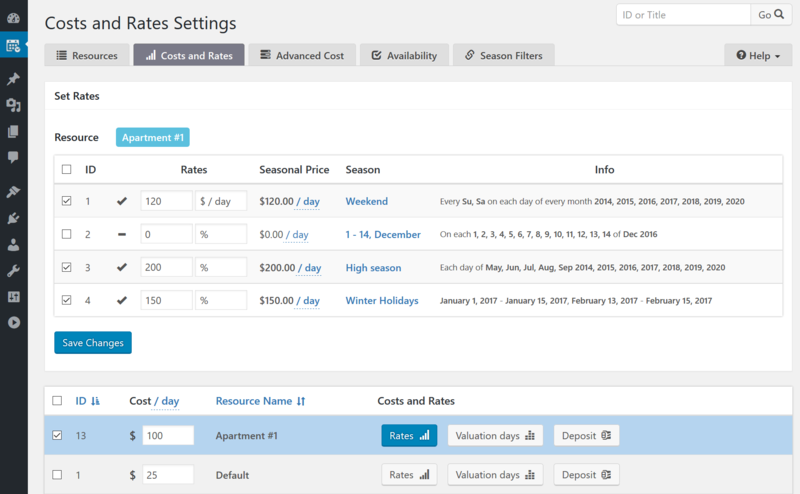 You can set as unavailable days in your booking resources for specific seasons. Its useful, when you need to block days for holidays or any other seasons during a year. You can set days as conditional seasons filters (for example, only weekends during summer) or simply select range of days for specific seasons. Note, instead of definition days as unavailable, you can set all days unavailable and only days from specific season filer as available. Configuration. 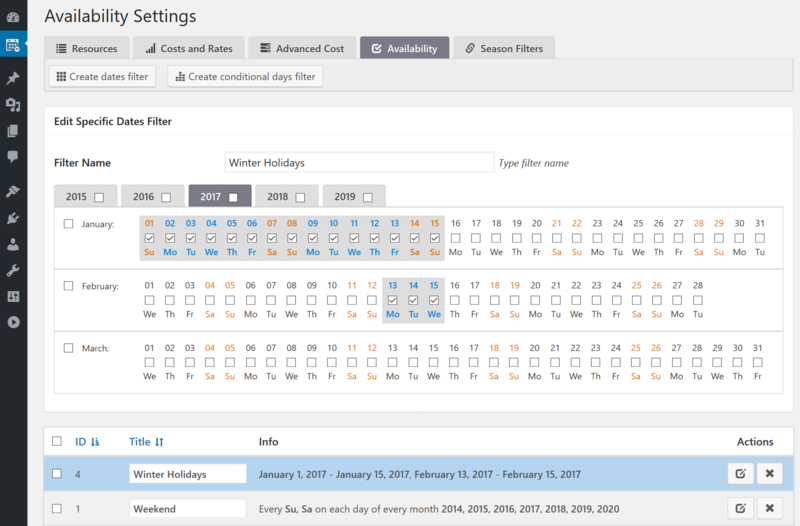 You can create or season filters at the Booking > Resources > Filters page and then at the Booking > Resources > Availability page set days from specific season as unavailable for the specific booking resources. Limit available days from today - defining specific number of available days, that start from today. All other future days will be unavailable. Also in any versions of Booking Calendar possible to define Unavailable days from today - defining specific number of unavailable days in calendar start from today. Its means that with these 2 options you can set interval of available days, that depending from today date. This option is useful, if you need to define some unavailable time/days for cleaning or any other srvices before or after booking. Important! This feature is applying only for bookings for specific timeslots, or if activated change-over days feature. Its does not work for full booked days. Set different daily cost (rates) for different seasons. For example, you can have higher cost for the "High Season" or at weekends. 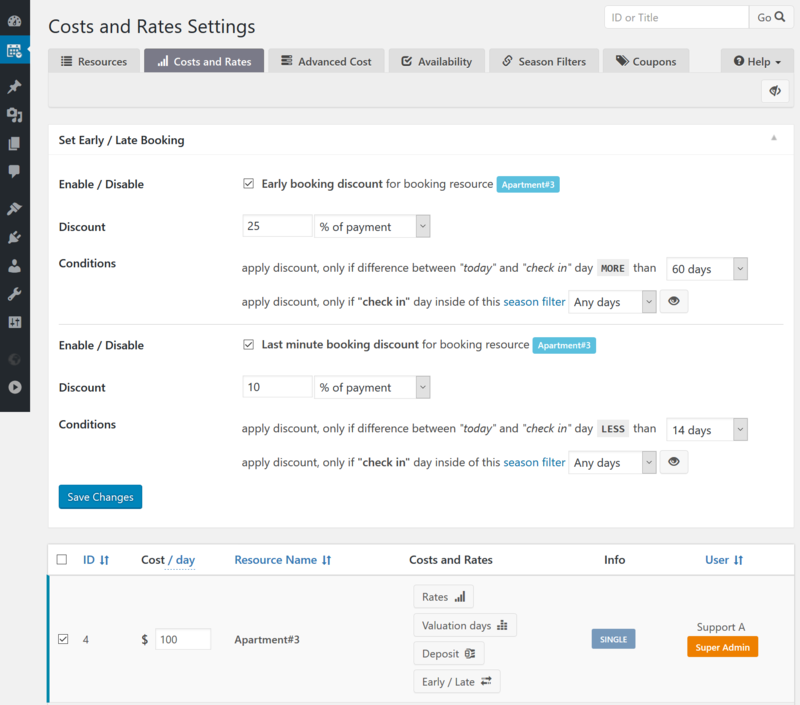 You can set rates as fixed cost per day (night) or as percent from original cost of booking resource. Configuration. You can set rates for your booking resources at Booking > Resources > Cost and rates page by clicking on Rate button. 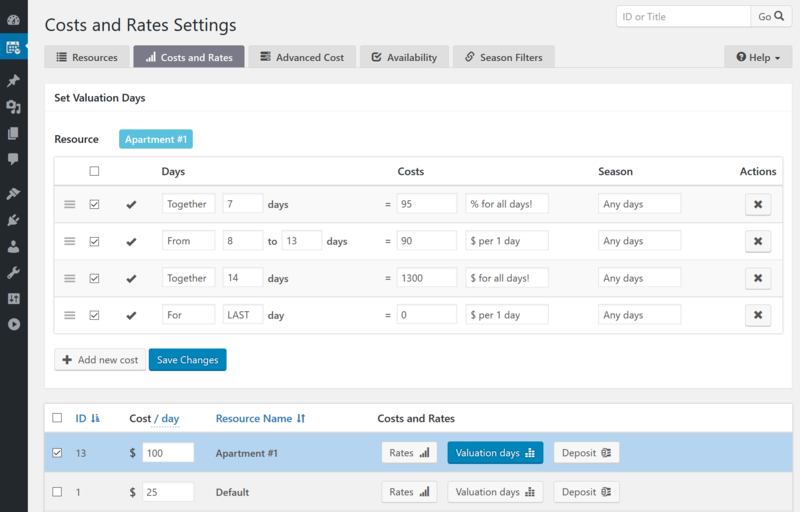 You can configure different cost for different number of selected days. For example, cost of second selected week, can be lower then cost of first week. 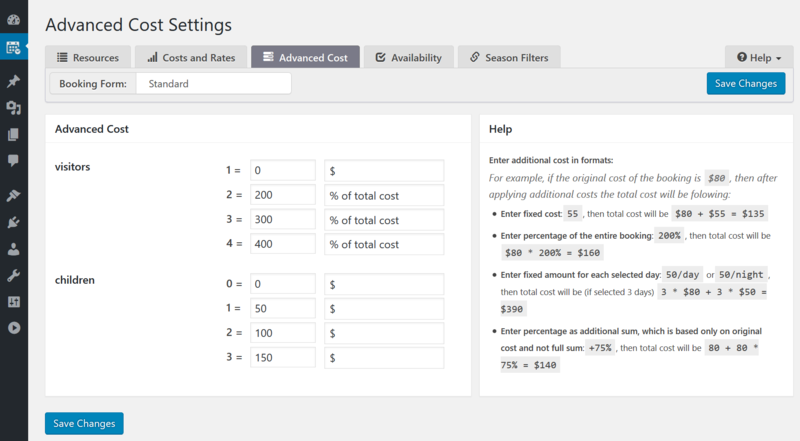 In addition, you can even set applying this cost only, if the "Check In" day in specific season filter. Configuration. You can set rates for your booking resources at Booking > Resources > Cost and rates page by clicking on "Valuation days" button. Set discount, if difference between "today" and "check in" day LESS than N days. Set discount, if difference between "today" and "check in" day MORE than N days. You can set discounts as fixed cost or as percent from original cost of booking resource. Configuration. You can set these discounts for your booking resources at Booking > Resources > Cost and rates page by clicking on Early / Late button. or just increase the cost of booking depends from the visitor number selection in your booking form. 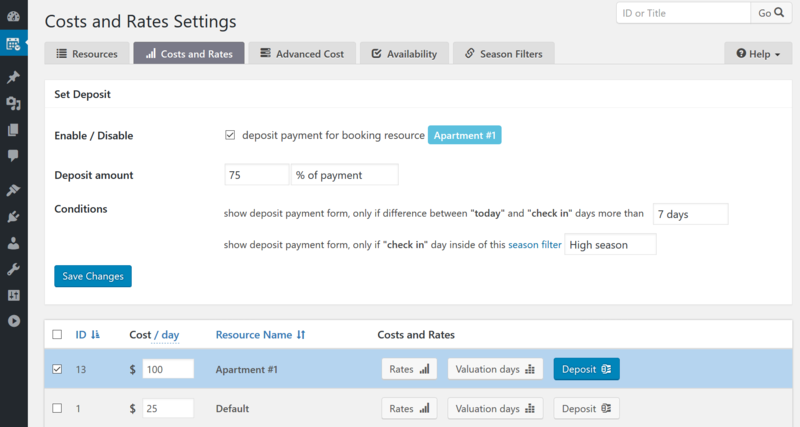 Its means that you can set additional cost for any selected option(s) in select-boxes or checkboxes at your booking form. You can set fixed cost or percentage from the total booking cost or additional cost per each selected day or night. Configuration. Firstly you need to configure options selection in select-boxes or checkboxes in your booking form at Booking > Settings > Form page, then you be able to configure additional cost for each such option at the Booking > Resources > Advanced cost page. You can read more about configurations of this functionality at the FAQ page here. Tip & Trick. You can show cost hints separately for the each items, that have additional cost at Booking > Resources > Advanced cost page. For example, if you have configured additional cost for my_tax option at Advanced cost page, then in booking form you can use this shortcode [my_tax_hint] to show additional cost of this specific option. Add "_hint" term to name of shortcode for creation hint shortcode. You can activate ability to pay deposit (part of the booking cost), after visitor made the booking. It's possible to set fixed deposit value or percent from the original cost for the specific booking resource. You can even activate to show deposit payment form, only when the difference between "today" and "check in" days more than specific number of days. Or if "check in" day inside of specific season. Configuration. You can activate and configure deposit value for specific booking resources at the Booking > Resources > Cost and rates page by clicking on "Deposit amount" button. 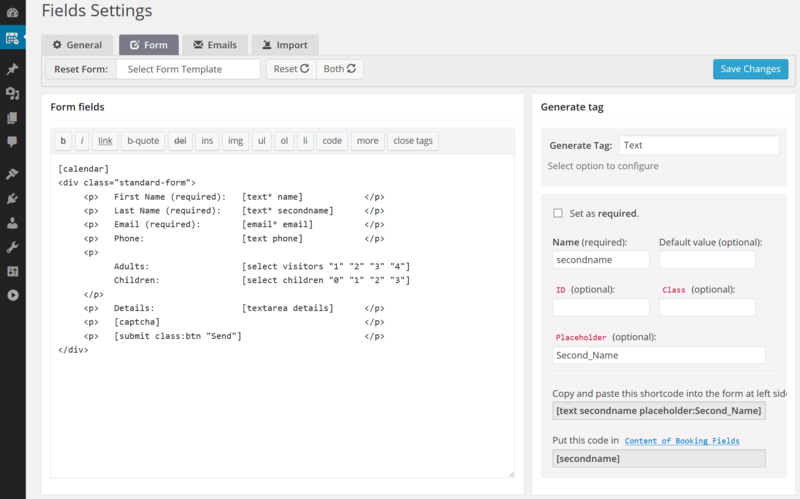 You can create several custom forms configurations. 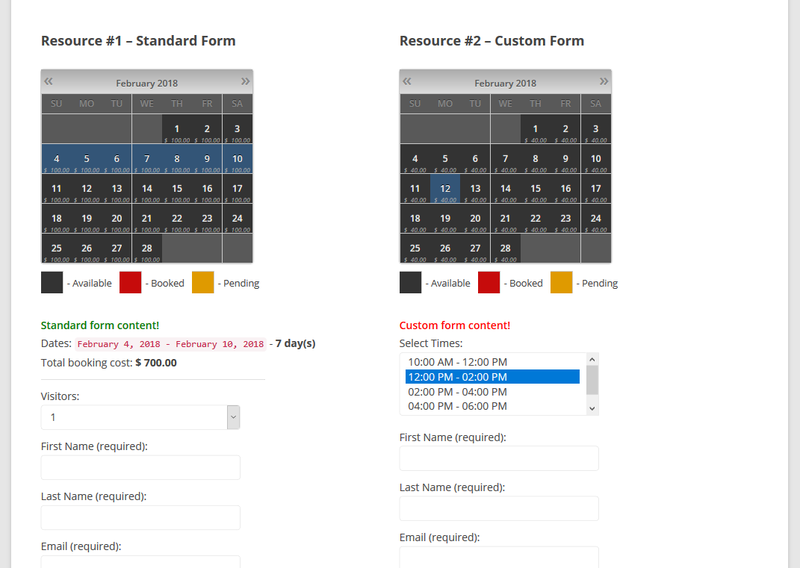 Its means that you can have the different booking forms (which have the different form fields) for different booking resources. You can also set specific custom form as default booking form to each of your booking resources at Booking > Resources page. Configuration. You can create several custom booking forms at the Booking > Settings > Form page by clicking on "Add new Custom Form" button. Specify that on specific week days (or during certain seasons), the specific minimum (or fixed) number of days must be booked. Also, you can define specific week day(s) as start day in calendar selection for the specific season. For example, in "High Season", you can allow start day selection only at Friday in the "Low Season" to start day selection from any weekday. Read more about this configuration here (at options parameter section). This feature provide ability to use the different time slots selections in the booking form for different selected week days or seasons. Each week day (day of specific season filter) can have different time slots list. Note. In the same way you can configure showing any different form fields, not only timeslots. Check many other nice features in Booking Calendar Business Medium version at features list and test live demo. You can receive several specific number of bookings per same days. and then dates in calendar will be available until number of bookings less than capacity of the booking resource. (data about time slots for booking resources with capacity higher than one, will be record into your DB, but do not apply to availability). Configuration. 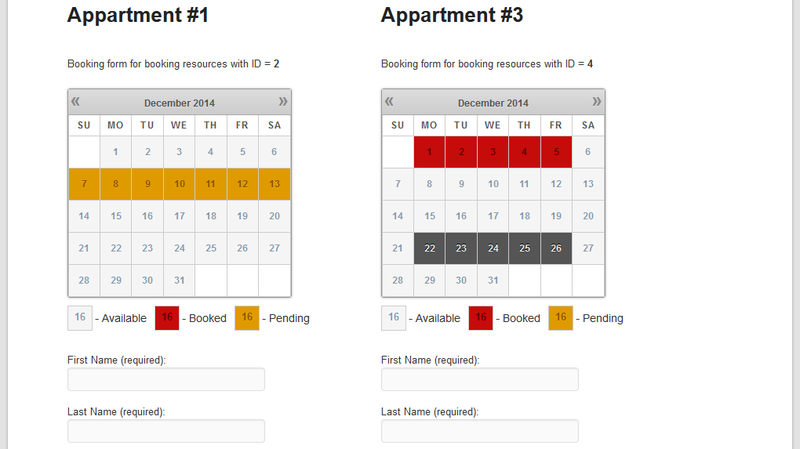 Set capacity of booking resources at Booking > Resources page. You can read more info about configurations of booking resources, capacity and availability at this page. 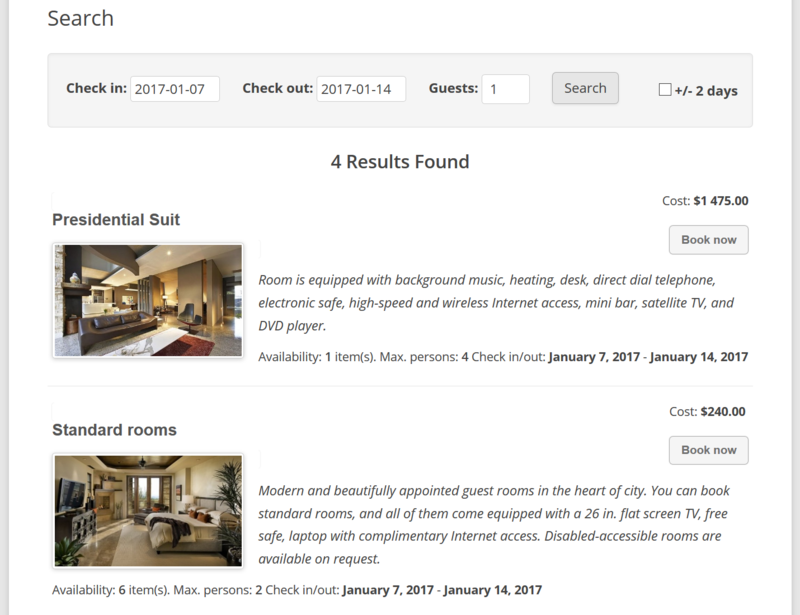 Your visitors can even search available booking resources (properties or services) for specific dates (like in this live demo). 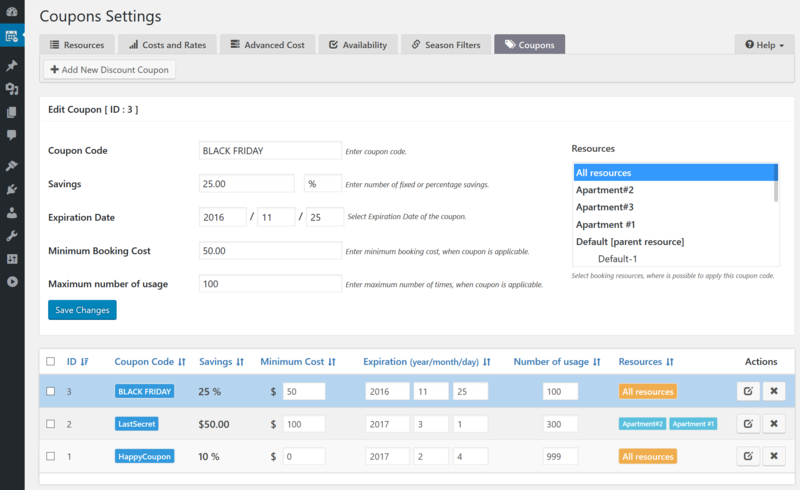 Beside standard paramters: check in and check out dates, number of visitors, you can define additional parameters for your search form (for example, searching property with specific amenities). You can read more about this configurations at FAQ. Note! Plugin will search only among pages with booking forms for single or parent booking resources. You need to insert one booking form per page. Configuration. Customize your search form and search results at Booking > Settings > Search page. After that you can insert search form shortcode into page and test. You can provide discounts for bookings to your visitors. Your visitors can enter coupon codes in booking form to get discount for booking(s). Its possible to create coupon code(s), which will apply to all or specific booking resources. You can set expiration date of coupon code and minimum cost of booking, where this coupon code will apply. You can define discount as fixed cost or as percentage from the total cost of booking. Configuration. Create your coupons codes for discounts at Booking > Resources > Coupons page. Then insert coupon text field into your booking form at Booking > Settings > Form page. Activate automatic cancellation of pending bookings for specific date(s), if you approved booking on these date(s) at same booking resource. You can activate this feature at the General Booking Settings page in "Advanced" section. Check many other nice features in Booking Calendar Business Large version at features list and test live demo. 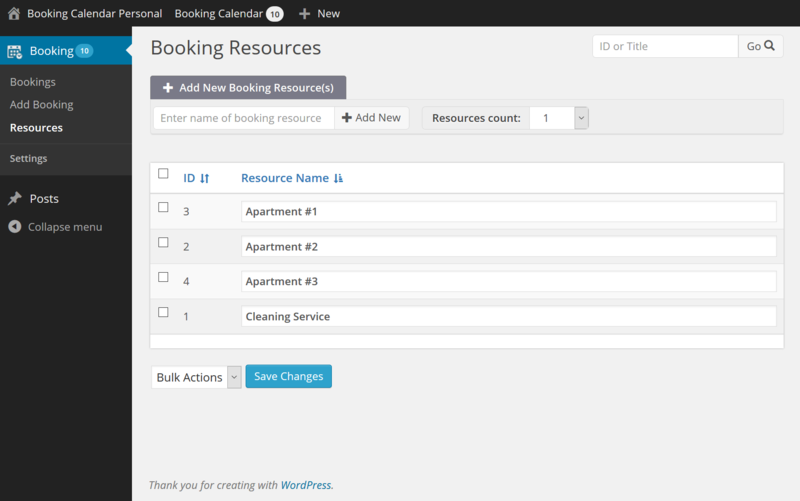 You can activate independent booking admin panels for each registered wordpress users of your website (withing one website). Such users (owners) can see and manage only own bookings and booking resources. Other active users (owners) will not see the bookings from this owner, they can see only own bookings. Each owner can configure own booking form and own email templates, activate and configure payment gateways to own payment account. Such users will receive notifications about new bookings to own emails and can approve or decline such bookings. There are 2 types of the users: super booking admin and regular users. Super booking admins can see and manage the bookings and booking resources from any users. Super booking admin can activate and manage status of other users. You can read more about the initial configuration at FAQ.